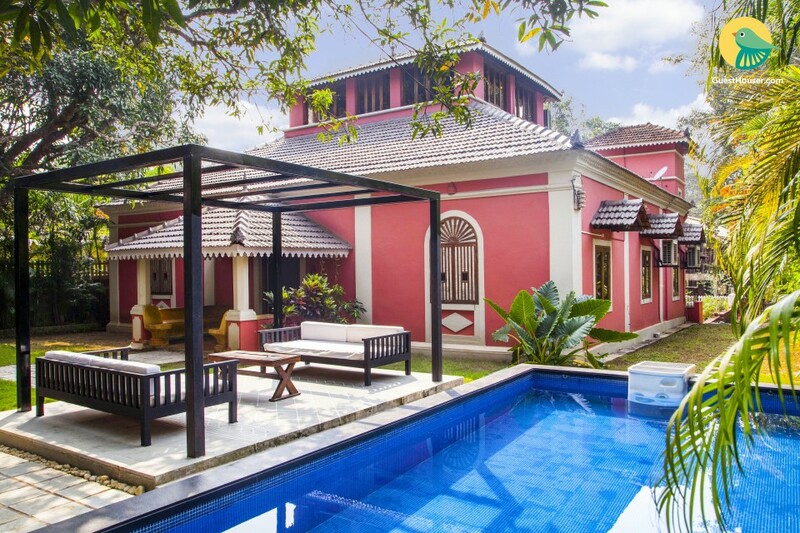 Located in Aldona, this is a gorgeous villa that oozes Goan charm. 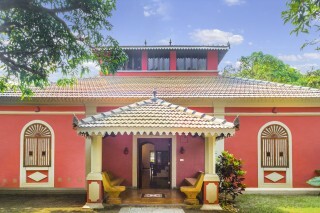 With a tiered Mangalore-style roof and arched window panes that is reminiscent of a traditional Goan home, this place has a traditional allure that is rather inviting. 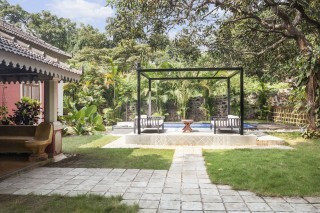 Stone walkways lead into the house and around, with a mud courtyard lined with garden palms and tall fruit trees providing pleasant shade. 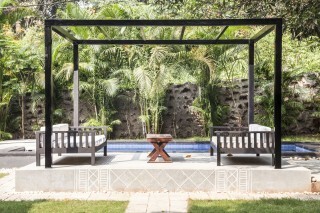 A veranda sit-out with stone benches and patterned Portuguese tiles shaded under a raftered ceiling makes for a tranquil space for some quiet time. The interiors of the villa are tastefully done up, with large wall arches leading from one space to another. The living space is furnished with comfortable seating with amber lighting on the walls and from the ceiling. A large eight-seat dinette makes mealtimes convenient, while a full-equipped kitchen can be used to prepare meals, for those of you who love to experiment with cooking! Daily provisions and groceries can be procured from nearby stores. A staircase leads to the upper level, where a lounge with a honey-coloured raftered ceiling and teakwood flooring encases a comfortable seating space, with leatherette Lawson-style sofas and a large flat-screen TV; a swing chair hangs from the ceiling, where you can cosy up on a lazy afternoon with a good book. The bedrooms on offer are compact and comfortable, with double beds that have finial posts that are reminiscent of colonial woodwork. The bathrooms are appointed with modern sanitary ware and all of them have a tiled border with large mirrors and partially painted stucco walls that bring the space to life. 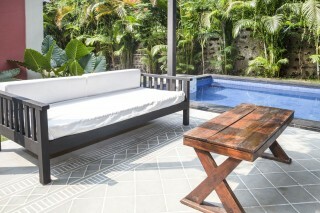 Head downstairs after a restful afternoon nap and take a cool dip in the shaded pool, while those of you who don’t wish to can relax on the daybeds under the pergola on the deck. Gather around with all your travel companions here and bond over some light-hearted conversation and banter! Those whole would like to shop for Goan specialities or souvenirs can visit the Mapusa Market or Anjuna Flea Market. Breakfast is complimentary here. 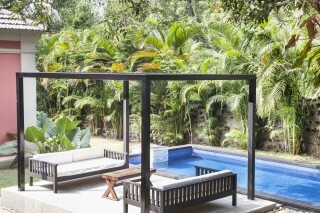 Guests have access to 4 air conditioned bedrooms, along with a lavish living area with luxe sitting arrangement. A fully equipped kitchen with a contemporary dining area allows guests to prepare their meals and enjoy them in the restful ambience of this villa. Each bedroom has its individual attached bathrooms, where essentials like toiletries and bath linen are provided. A cook can also be arranged upon request. Thivim Train Station is 18 km away. Goa international airport is 37.6 kms away.